There have been three previous big screen versions of Fitzgerald's novel: the 1926 silent adaptation, 1949's film noir influenced version, and the aenemic 1974 movie. Will Baz Luhrmann's much-anticipated 2013 movie achieve the success that eluded earlier attempts? 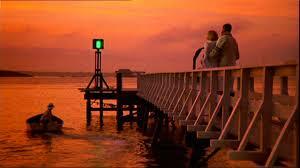 And what does Luhrmann's movie owe to the forgotten 1949 noirish "Great Gatsby" movie with Alan Ladd? Louis Wilson, who played Daisy in the now vanished 1926 version of Fitzgerald's book. 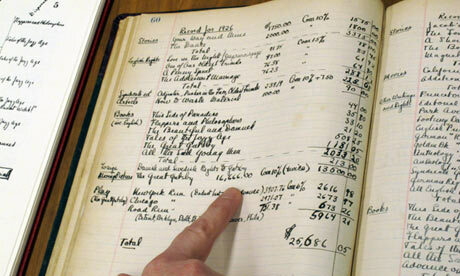 Fitzgerald's ledger, in which he kept a meticulous record of what he received in payment for his stories, books, movie work etc. At this time the novel had not achieved its inflated modern reputation of being an iconic piece of American literature. To the critic Jonathan Yardley, Fitzgerald's brief novel is "the American masterwork, the finest work of fiction by any of this country's writers." Unsurprisingly, in view of the books lush prose style and intense emotional nuances, there have been only a couple of movie adaptations since the 1926 version. And the novel's flaws don't assist the transition from book to screen. Daisy is a one-dimensional character, so selfish, stupid and irresponsible that it's hard to see what Gatsby saw in her. And Fitzgerald's portrayal of Gatsby is seriously flawed. We are constantly told that Gatsby is brave, intelligent, loyal, honourable, flawed only by his romantic vision of life and his noble infatutaion with the feckless Daisy. Yet this infatuation is never satisfactorily explained. Gatsby the character comes across as naive, gullible, easily manipulated, a poor judge of character - hardly the attributes of a highly successful bootlegger. The best known of these is the much-ballyhooed 1974 version, directed by Jack Clayton, scripted by Francis Ford Coppola and starring Robert Redford as a rather stolid Gatsby and Mia Farrow giving a one-dimensional, thoroughly annoying performance as Daisy. Only recently available for screening as a 35mm print and hard to find on DVD, this 1949 cinematic version of the novel was, perhaps like Gatsby himself, doomed from the start. Paramount only made to keep star Aland Ladd happy; the studio did its best to ensure the movie flopped. It was withdrawn from circulation in 1974 with the release of that year's new take on the Fitzgerald's book. The main interest in director Elliot Nugent's movie lies in its interpretation as a film noir. The posters above emphasise this aspect. Note the trenchcoat, the women's dresses, the femme fatale posturing and the caption on above right poster: "Ladd - Man of Violence and Mystery". This is Gatsby seen through a 1940s film noir perspective, with an emphasis on the bootlegging origins of his fortune - a great idea, although script and direction don't do it justice. 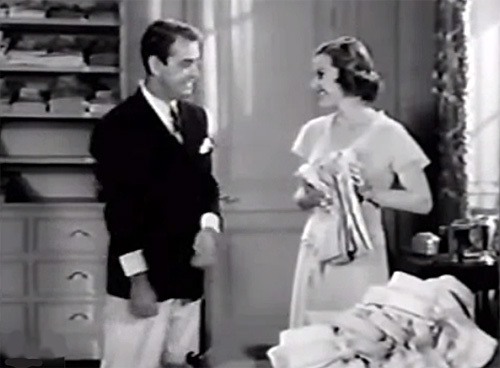 the 1949 film's version of the novel's famous "shirts" sequence, a symbol of Gatsby's wealth and opulent lifestyle which he uses to impress Daisy (Betty Field). Betty Field's performance as Daisy is one of the film's weak points, although it's no worse than Mia Farrow's in the 1974 version. 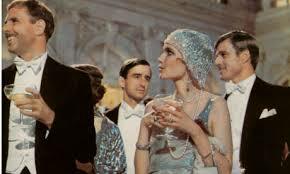 Party scene - Paramount didn't spend much money on providing lavish scenes of excess in this version of "The Great Gatsby". Confontation between Daisy and husband Tom Buchanan (Barry Sullivan) in the 1949 movie. 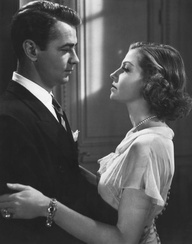 Alan Ladd's portrayal of Gatsby emphasises the character as a hero in the film noir tradition: a loner with a mysterious past fatally infatuated by a femme fatale. Director Elliott Nugent's 1949 rarely-seen black-and-white version of Fitzgerald's novel is not a great movie, nor is it even a particularly good movie. It's static nature all too obviously reveals its adaptation of a stage play based on the novel. Its 90 minute length suffers from being too faithful to the novel (as does Francis Fords Coppola's 1974 adaptation). One interesting addition to the novel is the film's use of framing sequences at the start and finish: Nick Carraway and Jordan Baker visit Gatsby's grave. Betty Field as Daisy is almost as inadequate in the role as Mia farrow proved to be in Jack Clayton's 1974 version. Paramount never wanted to make the film, and did so only at the urging of Alan Ladd, then one of Hollywood's major stars. Ladd, best known for his roles in crime and western movies, believed that he would make a convincing Gatsby. As it turned out, he was right. But Paramount, annoyed at Ladd's insistence on making a movie that they regarded as potential box-office poison, sabotaged its chances of success. They produced and marketed the movie as a cheap black-and-white melodrama and placed it in the hands of Elliott Nugent, a B-Grade director who was primarily a director of comedy. and who made his undistinguished films on budget and on schedule. The studio gave the role of Daisy to another B-grader, Betty Field, a stage actress. There were few sets, and little attempt was made to effectively convey the lavish and ornate lifestyle so essential to the context of the novel. Unsurprisingly, the movie was a box-office flop. 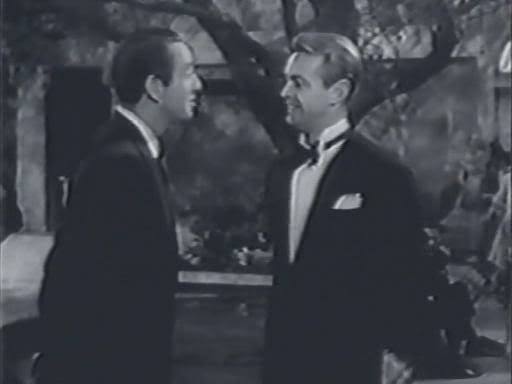 Macdonarld Carey as Nick Carroway with an urbane Alan Ladd as Gatsby. 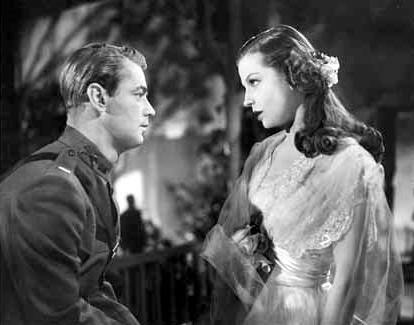 Unlike Robert Redford in the 1974 version, Alan Ladd makes gatsby believable as both a soldier and a man bedazzled by the shallow Daisy. Betty Field's Daisy is not particularly convincing, but she's not as annoying as Mia Farrow in the 1974 movie. Yet the 1949 Great Gatsby contains unexpected pleasures. The first of these is the focus on film noir elements - very likely a decision by Alan Ladd, no stranger to movies of this genre. Fitzgerald's novel contains some staples of what would later become the film noir genre: a loner hero with an obsession, links with criminal activities, social dislocation, a woman who can't be trusted and betrays the infatuated hero. 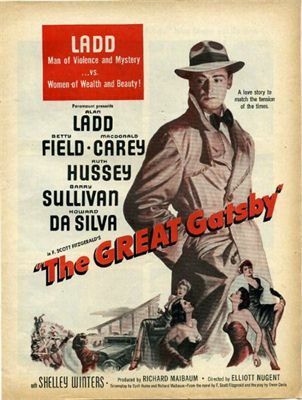 Ladd himself does a fine job playing Gatsby as a film noir man of loneliness, sadness, integrity and intelligence, blinded by his obsession for Daisy, and conveying an air of hidden menace indicative of his criminal past. He conveys a mood of increasing disillusionment with the social milieu in which he now moves. This version also fleshes out some aspects of Gatsby's criminal past. he is shown in flashbacks as using a machine gun in his bootlegging days. Actors well known for their roles in gangster movies, like Elisha Cooke Jr, also appear in bit parts as acquaintances of Gatsby, enhancing the crime context. Furthermore, Shelley Winters almost steals the film with her portrayal of the sleazy and earthy Myrtle Wilson, Tom Buchanan's girlfriend. These features make the film very much a 1940s movie about the 1920s - an interesting perspective and one which helps overcome the film's flaws. These two frames above reveal the good and bad aspects of Jack Clayton's 1974 version of Fitzgerald's novel. Magnificent photography of opulent settings, but also stilted, unimaginative and inert on screen. 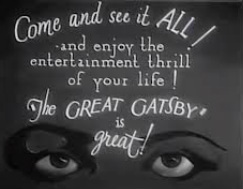 When director Jack Clayton's adaptation of The Great Gatsby was launched in 1974, it did so on a massive wave of publicity coordinated by Paramount Studios. At that time, the movie's producer and studio boss, Robert Evans, was at the height of his power. Also at the peak of their Hollywood popularity were its two stars, Robert Redford and Mia Farrow. The movie's glamorous settings - ritzy rich New York socialites with their mansions and estates in the 1920s, the era of excess - seemed perfect for a movie. And the opulent trappings of great wealth and material success that the film's production values focused on provided a movie publicist's dream. 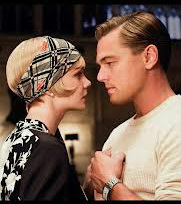 Magazines such as Time, Newsweek, Vanity Fair and countless fashion titles happily promoted Gatsby with articles and photo displays featuring clothing, jewellery, hair-styles,hats, furniture, curtains, motor-cars and even motor-boats that were on prominent display in the film. The publicity boasted about how much money had been spent to achieve the required degree of authenticity and style. The movie also came with a prestigious pedigree. By the 1970s Fitzgerald's brief novel was on its way to iconic status. Literary critics proclaimed it a masterpiece. For some it was the great American novel. This complex, sophisticated and subtle book was increasingly force-fed to high school students, and made required reading at colleges. It seemed the perfect marriage of high culture with popular approval. The film's script was also written by none other than Francis Ford Coppola, then in the midst of making three of the finest movies of the post-1945 era: the first two Godfather films and The Conversation. (Apparently Coppola complained that the movie misrepresented his intentions and Truman Capote was miffed that his contributions were thrown).The Great Gatsby's two boxoffice stars were backed by several talented actors: Bruce Dern as Tom, Karen Black as Myrtle, Sam Waterston as Nick. Location shooting used the mansions of the rich and famous at Newport, Rhode Island, standing in for Long Island, New York. However, despite the massive publicity campaign -which was probably perceived as overkill - this Great Gatsby turned out to be not so great. It received tepid critical reviews, and its boxoffice takings fell well below Paramount's expectations. "Every aspect of the ... film is bad" commented Stanley Kaufman, "...a long sickening bore." Most critics condemned the languid pacing, excessive length, and the general inertness of the entire film. Only the sets and costumes received general approval. Faufman called the performances "wretched". According to Vincent Canby, "Francis Ford Coppola, who wrote the screenplay, and Jack Clayton, the director, have treated the book as if it were an illustrated encyclopedia of the manners and morals of the nineteen-twenties instead of a short, elegiacal romantic novel whose idiosyncratic beat demands something more perceptive from the moviemakers than mere fidelity to plot." Much of the criticism focused on what was expected to be one of the movie's strong points - the performances of its two stars. Mia Farrow's Daisy is a shockingly bad piece of acting. Hers is an unsubtle performance without any subtlety. Farrow, employing an annoyingly tremulous voice and a perpetual pout, portrays Daisy as shrill, almost hysterical at times, perpetually pouting and sighing. And Farrow's skeletal physical appearance is throughly disturbing. Her performance only emphasises one of the novel's major problems: what does Gatsby see in this shallow, selfish and vain woman? Fitzgerald suggests that Daisy reveals the fatal consequences of Gatsby's romantic illusion. Unfortunately Farrow's interpretation has the effect of suggesting that Gatsby is a naive, gullible, rather foolish man to be infatuated by such a person . Redford's performance only enhances this perception. Although Nick Carroway constantly tells us what a mysterious, brave, noble, intelligent and thoughtful person Gatsby is, Redford fails to convey these attributes. Whereas Farrow puts and sulks, Redford frowns and ponders. He comes across a rather boring, staid clotheshorse of a WASP, not particularly bright and suffering from an adolescent infatuation. It is impossible to believe that he is a mid-Westerner with gangster connections who had made a fortune by dubious means. Alan Ladd's performance in the 1947 version is far superior. The weak performances by the two leads is only partly redeemed by those of the supporting cast who all display a lot more energy. Bruce Dern is absolutely convincing as the vicious Tom Buchanan, while Karen Black displays a tempestuous energy as Myrtle. Sam Waterston is interestingly doting as Nick (maybe Truman Capote was right in thinking that his insistence that Gatsby is a great man is significant of some deeper attachment) and Lois Chiles as Jordan does the best with what little the script provides her. Scott Fitzgerald made money by selling some of his work to Hollywood, but his screenwriting efforts there ended in disaster.